Posted on April 4, 2009 at 11:18 pm, under asian pop, music talk. I never thought I’d say this about DBSK, but this album is incredibly lowkey and mellow. The song starts off with Secret Game which is so fun to listen to until Yoochun started speaking in English and Yunho says “bingus” or something. 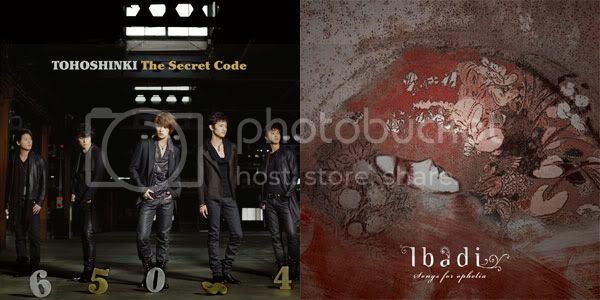 I’ve really been liking the first songs off their last two Japanese albums, TRICK being the one from “T.” Secret Game is interesting and transitions perfectly into FORCE. I really, really enjoy the playful melody of all these sngs, especially because they have a marching band quality to them, which is refreshing to listen to. It doesn’t exactly have the same “pop” feel of their other songs. Of the new songs, I’m not really feeling anything for Taxi, but that’s it. I think 9095 and 9096 are pretty creative, and I for one would definitely not be listening to those songs at night by myself. I’m pleased with the album and went in with no expectations because I barely keep up with these guys anymore, but my feeling is that in general, they put out better Japanese albums than they do Korean. They experiment more with their Japanese songs, whereas their Korean albums are a combo of the failsafe dance track + sixty five TRILLION ballads. In that sense, I never know what to expect from their Japanese albums, even if I have already heard more than half the album from previous single releases. I had no idea Ibadi was coming out with something new but this was a nice surprise. The mini-album doesn’t pack as much punch as their first album did, but it’s very dreamy. The only thing is, I feel like Curtain Call is very not Ophelia-ish and sounds rather like a Clazziquai song than Ibadi. The other kind of non-Ophelia-ish song is Secret Waltz, which I think this is the song that reminds me most of their first album’s work. Horan’s voice goes perfectly with Yi Sung Yol’s. Posted on October 14, 2008 at 6:58 pm, under asian pop, music talk, thinking out loud. This mini-album is really chill. There’s the same lonely-sounding music in this mini-album that has become Epik’s trademark. It makes me imagine that this is the kind of music you hear when you’re underwater. There’s a an eery sort of peace and tranquility. Not to downplay Epik High’s creativity or sound, but as I am with all their other work, none of these songs are songs that I would listen to on repeat unless I’m in a certain mood. The Japanese version of Mirotic is so hideous I don’t even know what to do with myself. It’s all choppy, has no flow, the rap EATS MY EARS, and it’s just…so hollow. The remix version of “Doushite” is really bland because it takes away the distinct quality that made the original so nice, which is the harp. Not sure if “Doushite” is the kind of song you can remix successfully, not because the original is just that good, but because there are elements in the song you shouldn’t tamper with, or else you throw the whole song out of whack. So basically, this single is moot. The only thing I really enjoyed is the instrumental version of “呪文 -MIROTIC,” which is rare because I never listen to instrumentals or usually think they’re pointless. But this song’s instrumental sounds like it would be a good insert to some sort of action movie during a casino / scaling-down-the-walls-avoiding-lasers scene. YMGA – Made in R.O.K. My head is already doing all kinds of spins upon realization that “YMGA” stands for “Young Men Gangsta’s Association.” I was semi-coerced into listening to this because of somebody showed me the music video for “Tell It to My Heart.” The first two songs (“Get Up,” “Scandal”) sound really sleazy and I ended up not paying a lot of attention to them. “Tell It to My Heart” is such a guilty pleasure song. I wish Uhm Jung Hwa were a stronger vocalist because then the song could’ve been a lot better. But I enjoy it as is, despite it being a remake. “What” is the best off the EP, especially during CL’s lines, but like the rest of the mini-album, it doesn’t stand out and blends nicely into the background when I’m not paying attention.